In its ongoing commitment to deploy the cleanest, most energy-efficient transit vehicles in Los Angeles County, Metro will purchase five new 60-foot electric buses and eight new charging stations for the San Fernando Valley’s Metro Orange Line thanks to a $4.3-million grant from the U.S. Department of Transportation, the agency announced today. 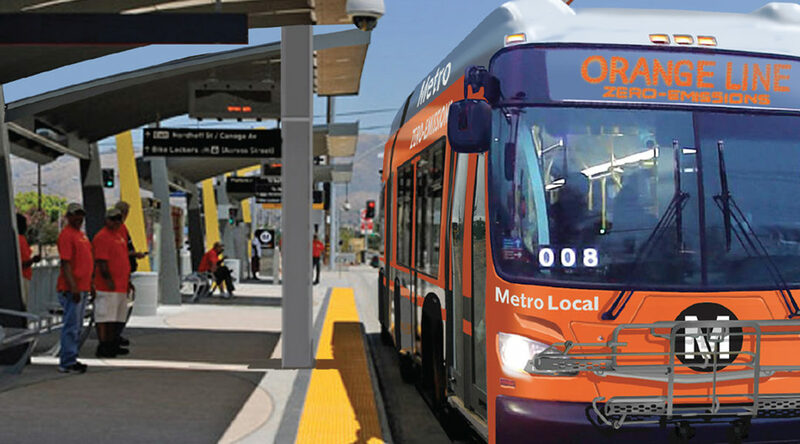 Combined with Metro’s $5.8 million match utilizing Measure R sales tax funds approved by voters in 2008, $10.1 million will be invested to jumpstart the Orange Line’s planned transition to all electric buses. New Flyer Xcelsior XE60 electric buses will begin operation by the end of next year. A media event was held this morning to announce the federal grant. From left, the FTA’s Ray Telles, Rep. Brad Sherman, Metro Board Chair John Fasana and Metro CEO Phil Washington. Photo by Gary Leonard for Metro. The Metro Board of Directors last week approved a motion calling for Metro to draw up plans to fully electrify the Orange Line by 2020. •This will be the first deployment of 60-foot articulated electric buses for transit use in the United States and the Orange Line will be the highest ridership transit service ever tested for all-electric operation. The Orange Line averages about 27,000 boardings on weekdays and carried 74 million boardings in its first decade of service (the line opened in fall 2005). •The project is expected to demonstrate the durability and reliability of lithium ion battery technology for high ridership transit lines. •The electric buses will replace 60-foot compressed natural gas (CNG) articulated buses that are now reaching the end of their normal service life. Metro Liner CNG buses have a 500,000-mile, 12 year lifespan. There are currently 43 60-foot buses running on the Orange Line today. •Buses will be capable of en route rapid charging and serving the Orange Line’s entire 22-hour daily schedule without having to return to the division for a recharge. Batteries can be fully charged in about seven minutes during scheduled bus layovers using a 450 kW rapid charger to be installed at terminus stations. The batteries are expected to provide a range of 66 miles between charges – enough for a minimum of four one-way trips. Additional charging systems will be installed at Metro’s Division 8 in Chatsworth for any off-peak charging needs. •Metro also last week announced that it had received a $10.5-million federal grant to buy 30 new near-zero CNG buses and a $1.875-million state grant to retrofit 125 existing CNG buses in its fleet with near-zero emission CNG engines. •Compressed natural gas is a fossil fuel but burns more cleanly and with fewer emissions than the old diesel-powered engines. Electric buses will eliminate direct greenhouse gas (GHG) emissions from buses although some GHGs may result depending on how local utilities create their electricity. •Still, generally speaking, taking transit is a good way to reduce your carbon footprint and help slow the pace of global warming. More here. No progress getting an exemption for 80 foot buses? The Orange Line could really use them. The New Flyer XE40 is a 40-foot bus. Does Metro intend to mix electric 40-foot and 60-foot buses on the Orange Line? 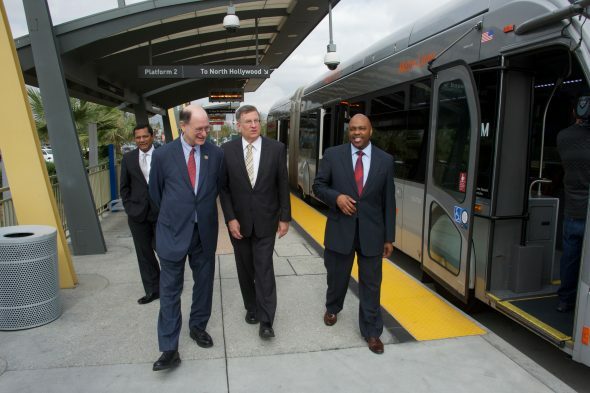 A state law was recently passed that allows the Orange Line to run buses 82-feet in length. Is Metro only intending to buy electric buses up to 60-feet in length? How does Metro intend to deal with the demand on the Orange Line without increasing the length of the buses? yeah, will they be 40 or 60 foot buses? The XE40 (←FORTY) is a FORTY-foot bus. I sure hope they’ll be 60 foot buses since as it is currently the orange line will get PACKED. Also, what’s the deal with so many of the triple bike racks on the newer XN40s (6000s-6149, 3850-4199) getting pulled off and replaced with older double racks. As a Division 5 rider I know that’s happened to almost all of their buses. Something else I hope not to see happen on the orange line. On a positive note though, I’m excited to see more New Flyers. We had a typo, it’s XE60 not XE40. It’s fixed. Thanks! Nice! This is significant in that it could set a precedent to go for more zero-emission buses. Metro should keep pushing the envelope on sustainability like this. This is false, though with a caveat. It will be first deployment of 60-foot articulated *battery-only* electric buses. San Francisco has been running 60-foot electric trolleybuses for decades now, and Seattle has them as well. Still, it is exciting to see this new technology start to get some serious use, and it will be interesting to see how it compares to the older and much more proven electric technology. > This will be the first deployment of 60-foot articulated electric buses for transit use in the United States . . .
NOT TRUE. The SF MUNI has been using 60-foot articulated TROLLEY buses since the 1990s, and they’re as electric as anything contemplated for the Orange Line (as well as free of the dead-weight of enormous battery packs (the newest MUNI trolley buses do carry enough battery power to go about a block or so off-wire, to make short detours around obstacles; I was on board one once, when it was necessary to use that off-wire capability). I wouldn’t mind knowing why we opted for battery powered buses on the Orange Line, when overhead wires — a much more mature technology, albeit one that requires a high degree of driver skill — would be more efficient. hey why Metro did not try out the Proterra electric bus? Foothill transit operates them in service since 2010, and they are still working well too after 6 years service. I am pretty sure these buses are a lot better than BYD one, and they get up to 350 miles range, which is pretty impressive. Metro definitely should try out the 40ft version on our local routes, so that we will have more electric buses on the streets.